Set in a rural village in southern japan in the late 1950s, the film tells the story of "gabai“ (or "super“) Granny and her grandson Akihiro, who ends up living with her for eight years. Granny is full of power and an expert at Yamamoto Taro, Suzuki Yôma, positive thinking. Through her, Akihiro learns to find the bright side of their poor postwar life and especially to never give up. Heartwarming portrait of life in postwar Japan, with legendary Yoshiyuki Kazuko from Oshima Nagisa’s Empire of Senses (1976) as resolute Granny. In the role of the mother Kudoh Youki, who’s achieved international fame in Snow Falling on Cedars (1999) and Memoirs of a Geisha (2005). 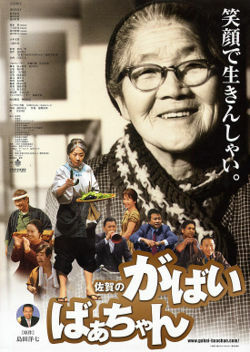 Based on the bestseller Saga no Gabai Baachan (Gabai Granny from Saga) (2005), in which popular comedian Shimada Yôshichi depicts his childhood memories.